Seattle Bank has teamed up with the Seattle Seahawks to offer fans a chance to receive the "Ultimate Fan Debit Card". 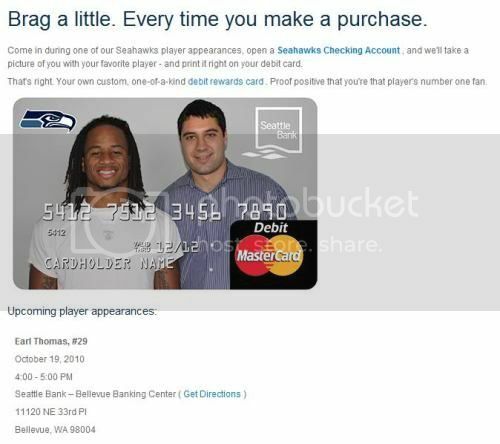 The regional bank is leveraging player appearances through their partnership with the Seahawks organization to offer fans the chance to have their picture taken with their favorite player and printed directly on their debit card. Seattle Bank's custom debit cards featuring Seahawks player likenesses serve as a great way to drive account conversions, promote affiliation awareness, and keep their retail locations top of mind in the wallets and minds of their customers. Brian Gainor is a passionate sports marketer with agency experience as well as an extensive background working in the NFL, NFL Europe, and collegiate athletics. Brian completed his MBA/MSA graduate work at Ohio University (Athens, OH) and currently resides in Milwaukee. As a Sports Partnership Activation Consultant, Brian created Partnership Activation, Inc. to provide sports business professionals with "industry best practices" - creative ideas that provide opportunities to generate incremental revenue. The opinions expressed herein do not necessarily represent those of the publisher, SponsorPitch, LLC. If you've seen a great activation tactic we should showcase, let us know about it by emailing tips@sponsorpitch.com.